American DJ Dotz Flood DJParts - All Variety of Parts that DJ Needs. ADJ’s Dotz Flood is a Wash/Blinder fixture with advanced COB LED technology allowing for a powerful LED engine to be placed in a small amount of space. The result is a high output, smooth color mixing fixture powered by six TRI COB LEDs. Dotz Flood is suitable for staging and nightclub lighting because it produces wide covers at a short distance and has no RGB color shadows. Dotz Flood includes barn doors to regulate the beam angle. The maximum beam angle is a wide 60 degrees. This fixture is compatible with the ADJ DF FC wireless foot controller with a wire-free range up to 30ft./10M. The fixture has many pro features such as: 0-100% electronic dimming, strobe/pulse effect, built-in shows and colors macros, and a 4-button LCD DMX display. Dotz Flood may run in its stand-alone mode from built-in programs, sound actively, or from a DMX Controller. It’s also compatible with the ADJ UC3 Series controllers. 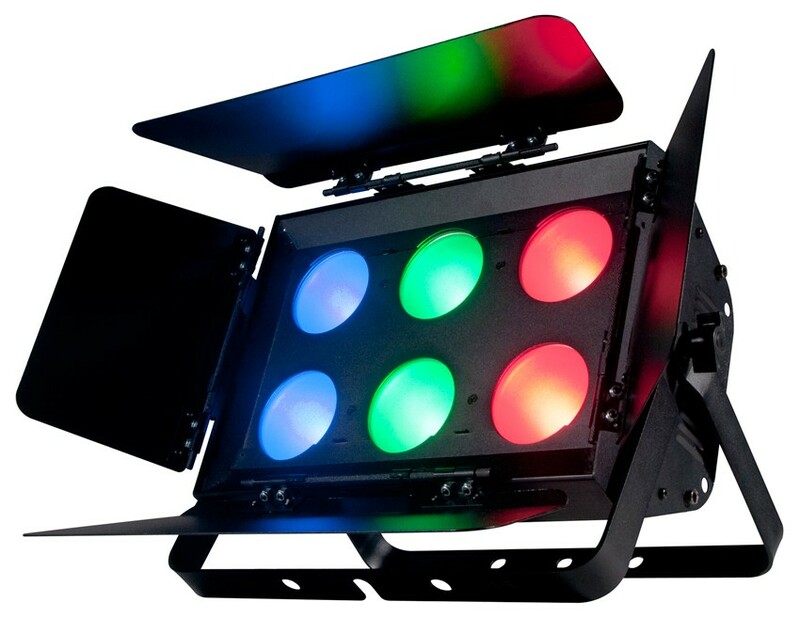 Specifications • Wash/Blinder fixture with six COB TRI LEDs (RGB: 3-IN1): 2 x 3 COB LED matrix panels • COB Technology (Chip On Board) produces powerful, smooth RGB color mixing with rich palettes of color • Includes barn doors to regulate beam angle • Great for Stage Lighting, Bands or Night Clubs • 6 DMX Channel Modes: 1, 3, 4, 5, and two 9 channel modes • 5 Operational modes: Auto (Show Run), Sound Active, Manual RGB Dimmer, Static Color, and DMX-512 Mode • 12 Built-In Programs Shows • 36 Built-In Color Macros (In DMX Mode Only) • Flicker Free • LED pulse and strobe effect • Pixel mapping capable • 60-degree beam angle • Electronic Dimming: 0 - 100% • Linkable via 3-pin XLR cable • IEC AC IN/OUT on rear to daisy chain power (up to 5 Dotz Flood's @ 120V and 9 Dotz Flood's @ 230V ) • 4-button LCD display on rear panel • Dual yoke system allows fixture to be hung or set on the ground • Fan Cooled • Light Source: 6x 30-Watt COB TRI LEDs (RGB: 3-IN1): • Power Draw: 120W • Compatible with American DJ UC3 Series easy-to-use controllers (sold Separately) • Built-in RF antenna compatible with ADJ DF FC wireless RF foot controller, control up to 30 ft./ 10M wirelessly (sold separately) • Multi-voltage Operation: AC 100V/60Hz - 240V/50Hz • Dimensions (LxWxH): 15.5” x 10” x 7.25”/ 389 x 251 x 182mm • Weight: 17 lbs. / 7.5 kgs.